Discussion in 'The Sound Hound Lounge' started by Poppa Stoppa, Mar 3, 2012. Holy slapback Robin - It just occurred to me that we need some more Scotty Moore appreciation round here! 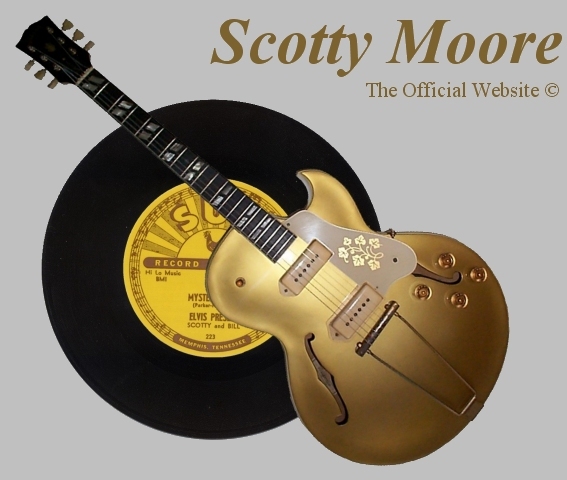 Can never have too much Scotty Moore! Those Sun Sessions are amazing. No wonder Keef always travels with a copy of them. Along with Chuck Berry, probably the most influential R&R guitarist. There is some really remarkable playing on the Sun Sessions. At first glance, you think it's rudimentary, but if you try to cop some of it it takes you by surprise. I like the solo in "Good Rockin at Midnight" its near the same as the opening riffs of "Pride and Joy"
This is why I started playing guitar. Him and Bill black changed everything. It's like Johnnie Johnson and Chuck Berry. If you listen very closely to Mystery Train right at the end Elvis can't contain himself and gives with a little laugh. They knew they were nailin' it! Dig his solo here. He almost gets out on a limb but it's so cool! Aggressive tone too. Yeah Scotty Moore is probably my ultimate guitar hero. Just the licks he put down on the sun sessions alone are incredible. Yeah he had influences but what he was coming up on the fly was amazing. His solo's on Hound Dog are out of this world too.